SAVE THE DATE: Wukkout!® is Back at Athleta for One Day Only this Month! Thank you to everyone who made our February Wukkout!® series at Athleta Flatiron such a huge success. Your energy in class was amazing and your support is always appreciated. We had such a good time that we will be back at Athleta again this month for one day only on Saturday March 12th at 3pm so mark your calendars! We are pleased to announce that VROU will be teaming up with us again to provide water for everyone post-Wukkout! Additionally, next week we will be sharing another surprise we have in store for you for that day so stay tuned! Once again, this class will be held at the Studio at Athleta Flatiron (126 5th Avenue @ the corner of 18th Street in Manhattan). Below you will find the information on how to register for the class. Class registration opens up 1 week prior to the class so for our Saturday 3/12 class, registration will open up this Saturday 3/5. I highly recommend signing up as soon as you can as the spots (and waiting list) fill up quickly. Huge thank you to Athleta Flatiron for hooking me up with these awesome workout clothes! 2) Download the MindBody App, register and create a profile, find the 3/12 Wukkout! class at 3pm and sign up. Please note that to ensure entry in the class, you must be on time. Athleta will start giving spots away to the waiting list and to any walk-ins once 3pm hits. Additionally, Athleta will not let anyone into the class after 10 minutes. The studio has a capacity of 35 people and last month we were filled to the brim. Get there early if you can! Feel free to email me if you have any further questions and click the image below to see video from our February classes! 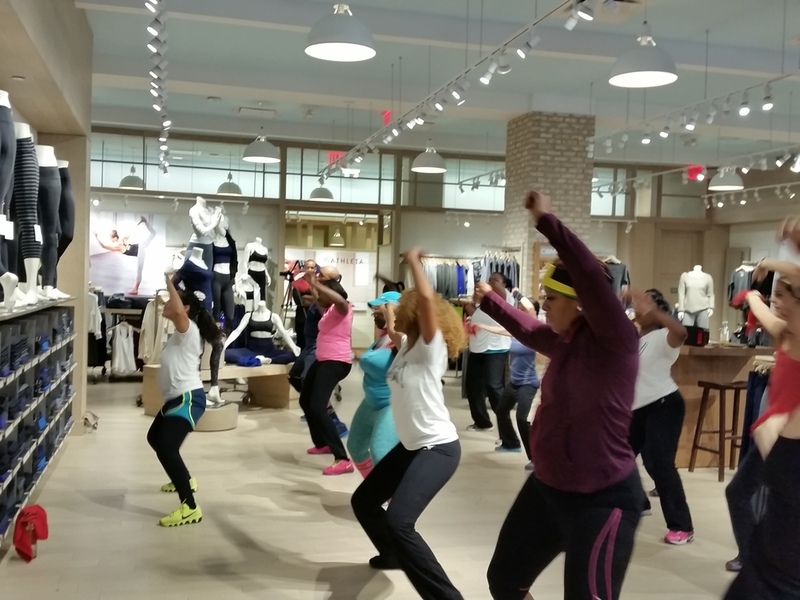 Wukkout!® was back at Athleta again on April 26th and we had a fantastic time! Thanks to all who came out to the event; I truly appreciate it. Huge shout out to Zahra Siddiqui for taking pictures and to VROU, Emmy's Organics and Nothin' But for providing healthy refreshments. Thanks to Athleta as always for hosting and for providing awesome gift bags for all of the attendees. I have many more events lined up for the summer so please stay in the loop by subscribing to the email list and following Wukkout!® on Instagram. Until then, join me at one of my other classes throughout Manhattan and Brooklyn. Thanks and hope to see you soon! You're Invited: Wukkout!® with me at Athleta 4/26! Check out pictures and video from our previous event at Athleta, here. Refreshments will be provided by VROU, Emmy's Organics and Nothin' But. Hope to see you there and remember, bring your flag or something to wave! Wukkout!® x VROU x Athleta was a Success! On Sunday January 11th I had the pleasure of teaching another free Wukkout!® class at Athleta; this time at their flagship location in the Flatiron district. It was a very cold morning but we managed to keep it hot inside the store! I'd like to give a special thanks to VROU for sponsoring the event and providing delicious refreshments for all of the participants. Big thanks to everyone who came out and to all of the newest members of #teamwukkout! If you'd like to be notified about any upcoming events, click here to sign up for our mailing list.